Mini chocolate chips make these pancakes extra special. Try one of the easy variations for chocolate chip pecan pancakes or banana chocolate chip pancakes. Top these chocolate chip pancakes with maple syrup, cane syrup, or a dessert sauce. 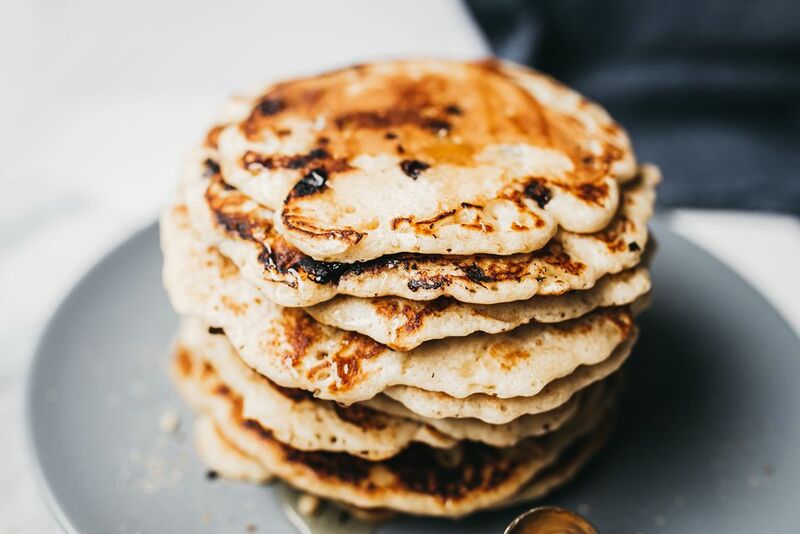 The pancakes are the perfect breakfast for a birthday morning or special occasion treat. The kids will love them! Make them a special dessert with chocolate fudge sauce and ice cream or whipped topping. They'll be an instant hit with everyone! in a large bowl, mix the flour, baking powder, salt, and sugar together until thoroughly blended. In another bowl, beat the eggs with 1 3/4 cups of milk until light and well blended. Add the melted butter and blend thoroughly. Blend the egg and milk mixture into the dry ingredients just until mixed. Add a little more milk, if necessary for a rather thick but pourable batter. Do not over-mix. Add a little oil and/or clarified butter to a large skillet or griddle and heat over medium heat. The oil is ready when a few drops of water "dance" when sprinkled over the griddle. Pour the batter onto the griddle using a 1/4 cup measure or scoop. Turn the pancakes when the bubbles forming around the surface pop and don't fill in with more batter. The second side will cook more quickly -- about half the time as the first side. Lift slightly to see if they are browned on the bottom. Move the pancakes to a plate, keep warm, and continue with the remaining batter. Serve the pancakes with maple syrup, golden cane syrup, or a flavored sauce. If the batter is very thick, add small amounts of milk to get the right consistency. The batter should be quite thick but should pour easily. Use a spoon or spatula to gently spread the batter into a circle. For lighter, fluffier pancake batter, separate the eggs. Beat the egg whites separately and fold into the batter just before folding in the chocolate chips. Banana Chocolate Chip Pancakes: Fold in about 1/2 cup of mashed bananas into the batter with the chocolate chips. Chocolate Chip Pecan Pancakes: Fold in about 1/4 cup of chopped pecans with the chocolate chips.